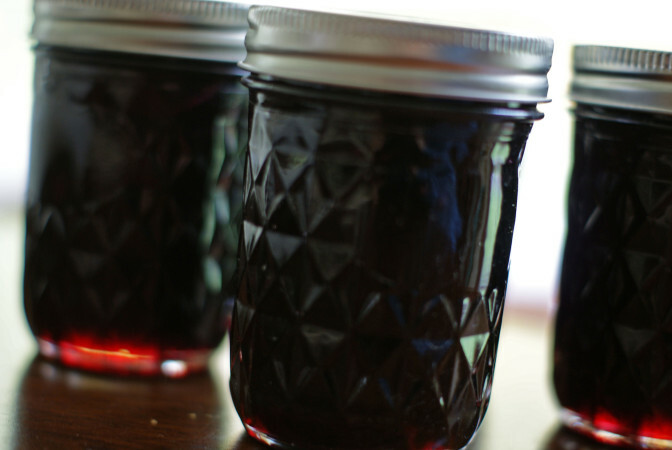 With all those beautiful grapes we picked at Eddy’s, we made jelly! I’ll tell you what, those grapes you get in the store have nothing on fresh-picked Concords. Now that is grape flavor. Anyway, you go through the whole mashing and straining to get the juice – we ended up with about two quarts. We decided then to make a lower sugar, no-pectin recipe (it was in the Blue Book, so I still trusted it). This one used about three cups of sugar for every quart of juice, and because there’s no pectin, you have to boil it (and boil, and boil) down to a syrupy consistency. This took me the better part of two hours. It ended up tasting just as good, but involved a lot more effort. And it also made less than the normal recipe. Although, now that I think about it, the increase in output has to at least partially result from the fact that you’re putting more than twice as much sugar in. Well, in any case, next time I’m going the full-sugar, full-pectin route, if for nothing else than to save me some time. And I’m announcing a leave of absence. No, don’t be scared, it’s only until Tuesday. We’re taking a (four-month) late anniversary/get away trip. Not quite like the vacations we took pre-C, but I’ll be happy with a long weekend.